Weird weather or just chaos as usual? By many accounts 2011 has been a year of weather extremes and some commentators have used certain events to highlight the risks associated with climate change. While there is increasing evidence of unusual global weather events, should we just assume that every disaster is a sign of things to come? I find, given my job title, that people do ask me about these associations, so it is perhaps time to put some thought to this and at least give my perspective on the issue. For me, two particular series of events have stood out in 2011, the very extensive flooding in my home country of Australia and the recent upsurge in tornado activity in the USA. 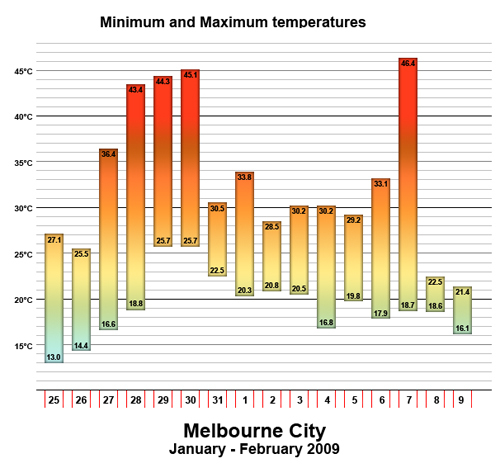 There are also plenty of other events in recent times – for example, “Snowmaggedon” in the US North East in January 2010, the Australian bushfires of 2009 and the intense heat wave of the same period and going back a bit further the European heat wave of 2003 during which all-time record temperatures were reached in many cities. Although Australia has a long history of bushfires, much of that part of Southern Australia also broke all-time temperature records in the days prior to the fires. As the world warms the convective processes in the atmosphere could be expected to increase simply because of the additional energy into the system. Similarly, global precipitation (rain, snow, ice) should increase as the hydrological cycle speeds up given the overall higher level of moisture held in the atmosphere. Estimating global precipitation is a relatively new field of science, but there is some evidence that precipitation levels may be increasing. The US National Climate Data Centre said early this year that 2010 equaled the hottest on record – less noticed was their calculation that global rainfall levels were the highest since at least 1900. February 2011: Record flooding across much of Queensland. April/May 2011: Super Outbreak of tornado activity in the USA, with high death tolls in Tuscaloosa and Joplin in particular. January 1974: Widespread major flooding occurred in almost all areas of the State during this month. Few areas had no flooding at all. One of these was the Dumaresq River upstream from Goondiwindi , where at one stage during the month , water was released for irrigation. Record flooding occurred in the Bulloo , Paroo , middle and lower reaches of the Flinders , Norman , Gilbert , Cooper , Diamantina , Georgina and Eyre rivers and creeks as well as Nerang, Brisbane City metropolitan , upper Brisbane, Bremer , Warrill and Logan rivers and creeks, the latter associated with Cyclone “Wanda”. April 1974: The Super Outbreak of tornadoes of 3–4 April 1974 remains the most outstanding severe convective weather episode of record in the continental United States. The outbreak far surpassed previous and succeeding events in severity, longevity and extent. The death toll was over 300. January – March 1936: In the period 6th to 15th January many western rivers flooded, especially in the north-west and south-west. Flooding was heavy in the Cloncurry-Mt Isa districts. The Cloncurry River reached the highest known level and the Leichhardt River was the highest for 20 years. There were big floods in the Burke River at Boulia where homes were partly submerged and stock losses reported. The Barcoo River was over the bridge at Blackall. Rail lines were submerged in several districts and traffic seriously disorganised. Local flooding occurred in a few eastern districts. Rail wash outs occurred between Bowen and Proserpine. A man drowned near Charters Towers and another in the Bell district. From February 14th and 20th there was extensive flooding in coastal areas between Cooktown and Mackay. Some serious inundations occurred especially in the Innisfail district where considerable damage was reported to crops and roads, and a lad drowned. April 1936: The 1936 Tupelo–Gainesville tornado outbreak was an outbreak of seventeen tornadoes that struck the Southeastern United States from April 5 to 6th, 1936. Approximately 436 people were killed by these tornadoes. Although the outbreak was centered around Tupelo, Mississippi and Gainesville, Georgia, other destructive tornadoes associated with the outbreak struck Columbia, Tennessee, Anderson, South Carolina and Acworth, Georgia. Severe flash floods from the associated storms also produced millions of dollars in damage across the region. 1936, 1973-74, 2010-2011 all correspond to a strong La Nina phenomena in the Pacific Ocean. There are probably other such combinations, the above is not meant to be a comprehensive analysis. With regards tornadoes in particular, a colleague of mine who is very well versed in climate science offered a useful perspective. Tornadoes are the result of two interacting phenomena – which perversely are trending in opposite directions. First, there is convective energy (which is increasing as the atmosphere warms) – the major source in this case being the warm sea water in the Gulf of Mexico. But more is needed to form tornadic super cell thunderstorms – so second is sufficient wind-shear, giving rise to local rotation (meso-cyclone formation). This wind-shear is connected to the winds aloft, i.e. the strength of the polar jet-stream, which in turn is tightly connected to the temperature contrast along the polar front (at it is greatest in winter and spring). In all climate models this temperature gradient declines over time because polar areas warm up faster than the (sub)tropics. How the combination of these two drivers will end up is highly uncertain. The same also applies to mid-latitude storms in general. What caused the mayhem in the US? The combination of a warmer than average Gulf of Mexico and a relatively cool spring in southern Canada and the Northern US created ideal conditions for violent tornado activity. Secondly there was awful luck – Tuscaloosa and Joplin received the direct impact of EF4/EF5 tornadoes. Meanwhile, the more clear-cut effects of a warming world are progressing. Arctic and Antarctic ice is declining and sea level is rising. Perhaps the Roman analogy is that while we are distracted by Tempestas flying overhead, Neptune has been knocking at the door and is now in the building.